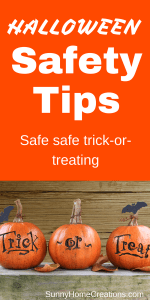 Safety is always the most important concern when going trick-or-treating. Especially if you have little ones that have never been before or are so young that they don’t remember the safety rules of previous years. Here are some important safety reminders to go over with your kids to help keep them safe when trick-or-treating on Halloween night. Make sure the costumes your kids are wearing aren’t so long that they become a trip hazard. Kids are often very excited on Halloween night and it is just so hard to walk from house to house, not to mention all the stairs your kids will need to go up to knock on some of the doors. If your child’s costume is so long that they can trip over it, they might get injured. So make sure any superhero capes, long dresses and gowns are short enough that they can walk easily with them on. If your kids try their costumes on beforehand with the shoes they are planning to wear then do a bit of running and walking around it should be easy to see if the bottom needs to be hemmed. Have everyone in your family trick-or-treat together. Even in your own neighborhood, it will take stress of your own mind by staying together. If you have teenagers, it’s usually OK to send them out on their own, but make sure the neighborhood they are going through is safe. Also, make sure your teenager knows some basic trick-or-treating courtesy rules. Such as if there is a bowl of candy on a porch, to only take one piece of candy. Trick-or-treating as a family can become a fun holiday tradition and you can make the Halloween dinner the same thing each year to make that a tradition as well. As you are walking around trick-or-treating, make sure to use caution. Make sure everyone is visible to cars. This is easy to do by having everyone wear a glow stick necklace. If any of your kids are wearing masks, make sure to remove them occasionally, especially if they are constricting. This will allow them to make sure they are getting plenty of air and if it’s a warmer night and they are sweating under there they can cool down a bit before continuing on. Make sure not to walk in the street. If there isn’t a sidewalk, then make sure to walk on the side of the road. It’s dark out and even if you have something reflective on or a glow stick, sometimes cars still can’t see you there until it’s too late. Only go up to houses that has their porch light on. If the house doesn’t have their outside lights on, most likely they don’t want trick-or-treaters. Never go into any house. When trick-or-treaters come to your house, you want to make sure they are safe as well. Make sure your front yard is well lit. You can put out some battery-operated lights into your pumpkins so they add a little bit of light and all your outside lights on. Make sure the leaves on the walkway up to your door is swept. If you have a dog, make sure they are inside and restrained. If you are worried about your dog (or other pets) with all the opening of your front door, set up a station for yourself in your front yard. Either on your porch or at the end of your driveway. I’ve seen parents do this when their kids/baby are inside sleeping and they don’t want the constant knocking and ringing of the doorbell to wake their child up. If I left out some safety tips, make sure to share in the comments below. I wish you all a happy and safe Halloween!